Kootu curry recipe: Kootu means ‘mingling’ or ‘a combination’, so as the name implies, it is a mixture of black chickpeas (or) chana dal and combination of vegetables like ash gourd /winter melon, raw plantain/kaya, elephant yam /chena with ground coconut and spices. It’s a semi dry preparation and is prepared in different styles in different parts of Kerala. When i think about onam the main dishes i would like to taste is Kootu curry and Erissery. Both dishes contain roasted coconut init and gives lots of flavour and texture while eating. Hope every one feels the same thing i guess. Kootucurry and Erissery looks similar and the main difference, as per me Erissery and kootucurry almost tastes similar becos in both dishes roasted coconut is used. Erissery should be spicy than kootu curry sometimes pepper powder is used in erissery. Kootucurry bit jaggery is used, so spicy bit sweet curry is kootucurry. Kootu curry Chana dal or whole chana is used. In Some Erissery cowpea is used people replace it with chana. Pressure cook channa dal on medium flame for 2 whistles. If you are cooking directly, soak dal in water before cooking. Grind coconut and jeera together as coarse paste; set aside. Add the vegetables in a pan by adding enough water to submerge and cook till soft but not mushy. Once it is half cooked add the salt and cook further. The vegetables has to hold its shape after cooking. Add turmeric, chilli powder and jaggery and mix well and allow to cook for a minute. Add the ground coconut paste and mix with the cooked vegetables and cook for a minute. Now add the cooked dal and mix well and cook for a minute. Meanwhile roast coconut, mustard seeds, urad dal, curry leaves and broken red chillies till the coconut gets brown colour. Add this roasted coconut mixture into the kootu curry and mix well and immediately switch off the gas. 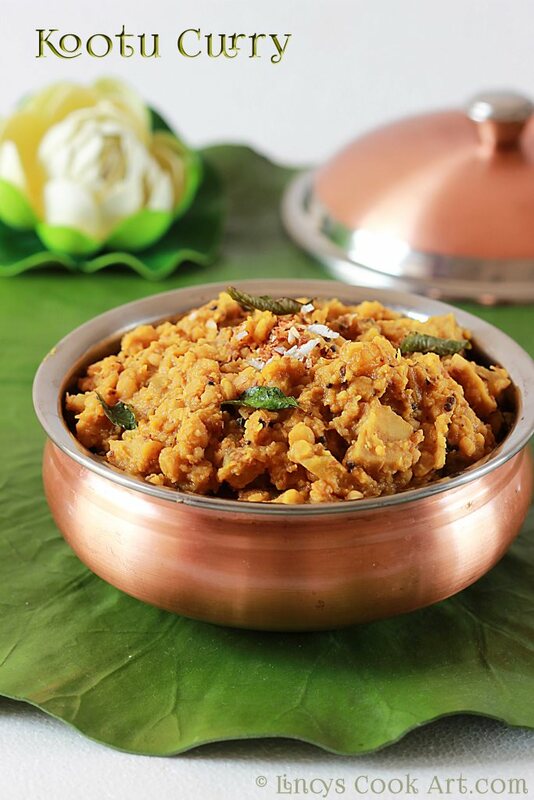 Note: You could replace ash gourd with carrots or raw plantain/banana to make this kootu curry. Chana dal could be replaced with whole chana white or black. thanks a lot for your compliments. shall visit yours too..